As a teacher, Elaine believes there is always room for improvement. She also believes improv should be really, freaking fun. Elaine is passionate about helping students become better comedic performers. She believes improv is best when students are truly working together and discovering humor in surprising places. Elaine pushes her students to make bold choices, and take care of themselves and each other. Her overall goal as a teacher is to create a welcoming and supportive classroom where students are constantly challenging themselves and others. Her secondary goal is for students to leave class with a fanny-pack full of tools they can use to quickly ground themselves on stage and refocus, or redirect, a scene. Her tertiary goal is get WIT to supply all students with fanny-packs. Elaine is a member of Love Onion and iMusical. She also has a fancy master’s degree in Education and spends her work week designing education programs for doctors, so you can trust she totally knows what she’s doing. 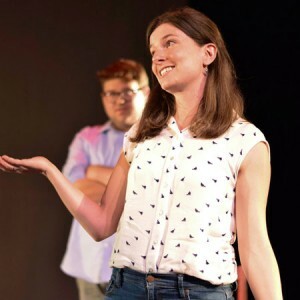 As a poor and lonely intern, Elaine from Maine took her first free Improv for All workshop with Washington Improv Theater in 2012. Since then, she has obtained a steady day job to appease her father and completed the WIT curriculum (she is still, and always will be, accepting graduation gifts). Elaine is currently a member of iMusical and Love Onion. With these groups, she’s performed in comedy festivals around the country. She is a co-creator of Bring Back the 90s at the Unified Scene Theater, and can be found playing around town with indie teams Burger and We Broke Up. In her spare time, Elaine works on a variety of creative projects including short films, podcasts, character sketches, and writing upbeat songs about things and people she hates.